Aisthesis - Film og filosofi: "Nånting måste gå sønder"
Torsdag 30. april inviterer vi til Aisthesis – film og filosofi på Cinemateket. Natalie Hope O’Donnell og Malene Dam kommer for å snakke om filmen «Nånting måste gå sønder» (2014). Arrangementet vil bli avholdt på engelsk, og filmen vil ha engelsk undertittel. 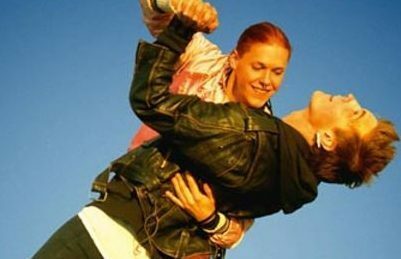 Arrangementet er et samarbeid mellom Filosofisk supplement, Skeive Filmer / Oslo Gay & Lesbian Film Festival og Cinemateket i Oslo. On Thursday 30 April 30, Aisthesis will host a talk by Malene Dam and Natalie Hope O’Donnell, followed by a screening of «Something must break» («Nånting måste gå sönder») (2014). The talk will be held in English and last about 30 minutes. The film will be screened with English subtitles. Natalie Hope O’Donnell, PhD research fellow ved Arkitektur- og designhøgskolen i Oslo; og Malene Dam, som holder en grad fra The Center for Curatorial Studies ved Bard College, New York. In «Gender Trouble» (1990) Judith Butler makes the point that gender is a construction, and highlights the power of language to construct and subvert identity through naming. Ester Martin Bergsmark’s film, which traces the budding romance between Andreas and Sebastian/Ellie, is a testament to the fluidity of the category of gender, and the transformative potential that resides in naming, for oneself. Drawing on the queer theories of Butler and Rosi Braidotti, the film can be seen as part of a wider project critiquing normative gender constructions by affirming the unfettered nature of desire, which moves across a spectrum of gender presentations. As curators with a special interest in queerness and gender identity, Malene and Natalie will contextualise the film in relation to the work of Braidotti and Butler, drawing on examples of artists operating in the expanded field of gender performativity. Natalie Hope O’Donnell is a curator and PhD research fellow at the Oslo School of Architecture and Design. Malene Dam is a curator and artist currently based in Copenhagen, and a recent graduate from the Center for Curatorial Studies at Bard College, New York.